IntelliMouse is a series of computer mice from Microsoft. The IntelliMouse series is credited with a number of innovations, for example, Microsoft was among the first mouse vendors to introduce a scroll wheel, an optical mouse, and dedicated auxiliary buttons on the side of the mouse. They use IntelliPoint drivers and its main competitor through the years has been Logitech. The original IntelliMouse was introduced on July 22, 1996, with its stand-out feature being a scroll wheel. Its design was based on that of the Microsoft Mouse 2.0 from 1993. In 1997 Microsoft made the IntelliMouse Trackball, a variant featuring a trackball. In May 1998 the IntelliMouse Pro was released, a redesign of the original IntelliMouse. The IntelliMouse Explorer was introduced on April 14, 1999, at COMDEX. This version featured IntelliEye optical tracking technology, eliminating the need for a mouse ball or mousepad. It had five buttons (two on top, a scroll wheel that could be depressed, and two on the left side of the mouse). It was asymmetrical and designed for right-handed users. Microsoft called it the "most radical computer mouse technology and design advancement" since computer mice were introduced in the 1960s. It was released on October 4, 1999. 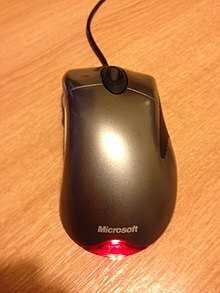 The IntelliMouse Optical was released in April 2000. It had five buttons – two on top, the scroll wheel, and one on each side of the mouse. IntelliMouse Explorer 2.0 was introduced in 2003, including a wireless variant called IntelliMouse Explorer for Bluetooth. The 3.0 version was also made that year but later discontinued, before being re-released in 2006. On October 17, 2017, Microsoft revived the series with the new Classic IntelliMouse, featuring a new dark look based on the IntelliMouse Explorer 3.0 design and featuring BlueTrack technology, allowing it to be used on glass surfaces. ^ Note however: "Mouse Systems ProAgio Scroll Mouse". oldmouse.com. Retrieved 2013-08-15. In 1995 Mouse Systems, owned by KYE since 1990, produced the world's first mouse with a scroll wheel. It sold as Mouse Systems ProAgio and Genius EasyScroll under Kye. [...] Microsoft seized the idea and marketed the concept as part of their IntelliMouse® in 1996. ^ "Microsoft announces Microsoft IntelliMouse". Microsoft. 22 July 1996. Retrieved 9 November 2014. ^ a b c "Microsoft's sleek new IntelliMouse Explorer and IntelliEye technology toss out the mouse ball today at COMDEX" (Press release). Microsoft. 19 April 1999. Retrieved 22 November 2018. ^ a b c Waring, Becky (30 March 2000). "Microsoft builds a magical mouse / new buttons, scroll wheel and no gummy ball". SFGate. Retrieved 22 November 2018. ^ "Microsoft announces availability of IntelliMouse Explorer". Microsoft. 4 October 1999. Retrieved 9 November 2014. This page was last edited on 21 March 2019, at 02:00 (UTC).